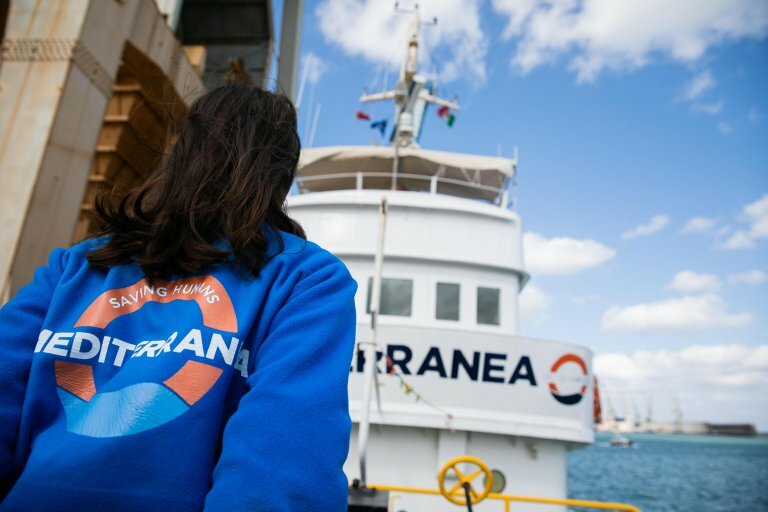 The Italian organization “Mediterranea Saving Humans” is only a few months old, having been formed in October 2018. Now its ship, the Mare Jonio, is the latest migrant rescue vessel to enter into a stand-off with the Italian government after it saved 49 people from the Mediterranean on March 18. It is becoming a familiar story. The left-wing mayor of Lampedusa, like other Sicilian mayors before him, has declared his port open to migrants rescued at sea. The Italian Interior Minister Matteo Salvini has declared all Italian ports closed. Bobbing just off the coast is the Mare Jonio, a ship flying an Italian flag, headed by an Italian Head of Mission, running on money fundraised largely in Italy with 49 rescued migrants on board. It is banned from entering an Italian port. In a new directive issued on Monday, Salvini said that “the passage of rescue ships in Italian territorial waters [was] detrimental to the order and security of the Italian state.” Salvini argues that the Mare Jonio, like other ships before it, has rescued people in the designated Libyan search and rescue region. This means that they should follow Libyan directives and disembark anyone rescued in the nearest safe port. NGOs argue that human rights are repeatedly being violated in Libyan detention centers, both official and unofficial ones and that people should not be sent back there. Mediterranea Savings Humans wrote on its Twitter feed that Salvini’s directive (to close the ports) is invalid and goes against the law and international conventions. The platform states that Mediterranea was created because its ideators could no longer watch with indifference whilst thousands of people drowned at sea. It said it was born to deliver justice and in the hope of doing something good. 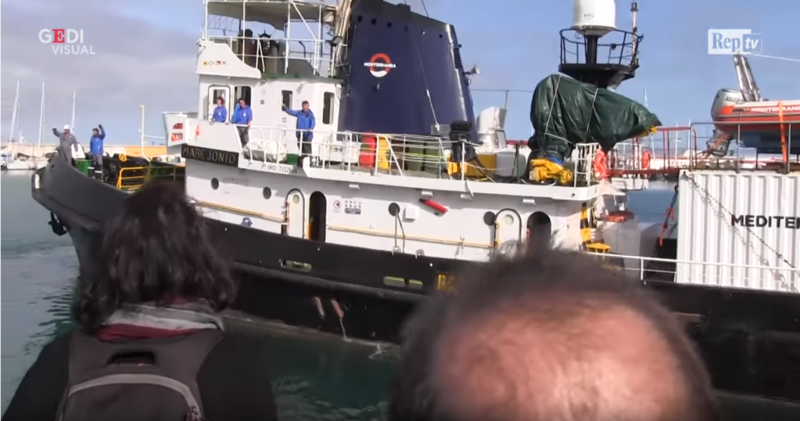 Lampedusa’s mayor, Salvatore ‘Totó’ Martello, told the Italian press that he couldn’t see how it was possible to block an Italian ship from entering an Italian port. “Which convention prevents a ship from entering a port in its own country?” Martello asked rhetorically “I don’t know of one,” he answered. The crew of the Mare Jonio has said on social media that many of the 49 people they rescued show clear signs of abuse and torture which they allege happened on Libyan soil. 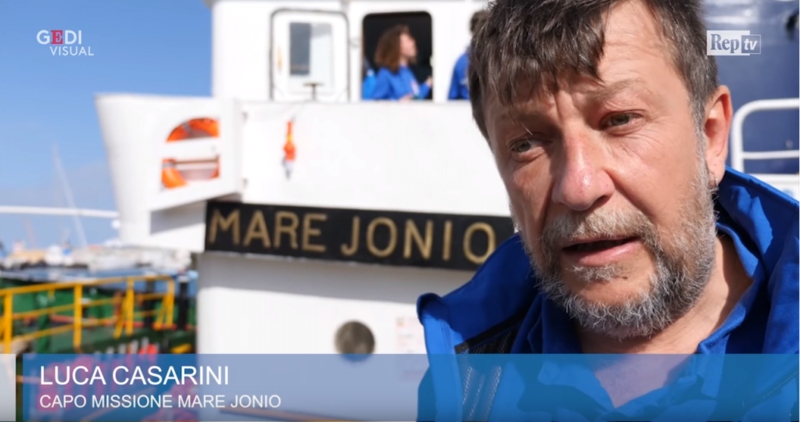 The head of the Mare Jonio’s mission is Luca Casarini, whom the website Wired.it described as the brains behind the birth of this latest rescue ship. 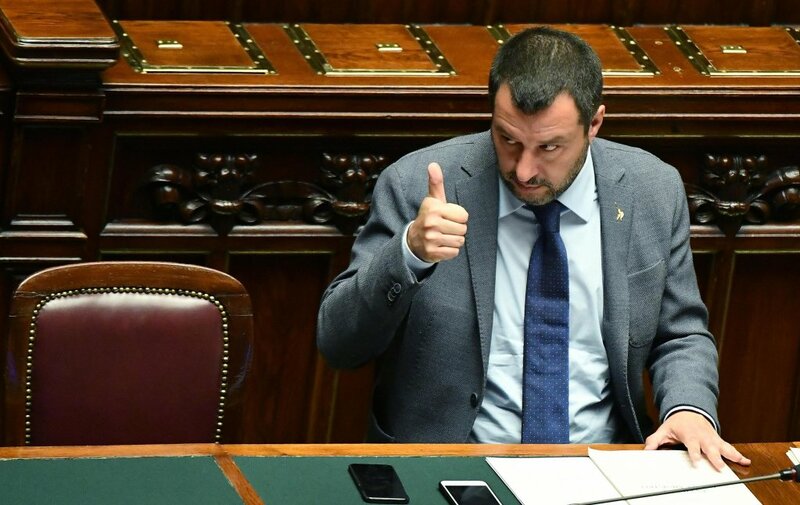 Salvini calls Casarini (derogatively) “a guy from the Centri Sociali.” The term ‘Centri Sociali’ is difficult to directly translate into English. Sometimes they are equated to squats, and usually, they are associated with left-wing to anarchist political views where people gather and launch political campaigns. They are usually anti-establishment. Sometimes people also sleep, live and eat communally at the center, but not always. They are also not always illegally occupied. Casarini has spent years demonstrating against various government policies in Italy. First against the wars in Iraq and Afghanistan and then as one of the organizers in the G8 protests in Genova in 2001, when violence broke out between protestors and the police, and some people died. In 2018 he decided to build a boat to save migrants. He calls Mediterranea “a social platform” rather than a new NGO and stated that he wants the Mare Jonio “to become a symbol. If Italy and Europe close their ports, we are calling on the people to protest in the streets.” The boat has been funded by a coaltion of leftwing politicians, anti-racist associations, intellectuals and figures in the arts and supported by two other migrant rescue organizations, the Spanish Proactiva Open Arms and the German SeaWatch. It is currently the only boat operating in the central Mediterranean. Casarini called European governments “hypocrites” for shutting their eyes to the “torture of men, women and children,” instead of dealing with the people who were trying to reach Europe. Speaking to the Huffington Post Italian, the spokesperson and head of the legal team for Mediterranea Saving Humans, Alessandra Sciurba, said that they were calm because they knew they were “on the right side and the side of the law, in saving people in distress at sea.” Reportedly the Italian coast guard and the Guardia di Finanza (tax police who also work at the country’s frontiers) were inspecting the Mare Jonio in an “orderly manner” on Tuesday morning. 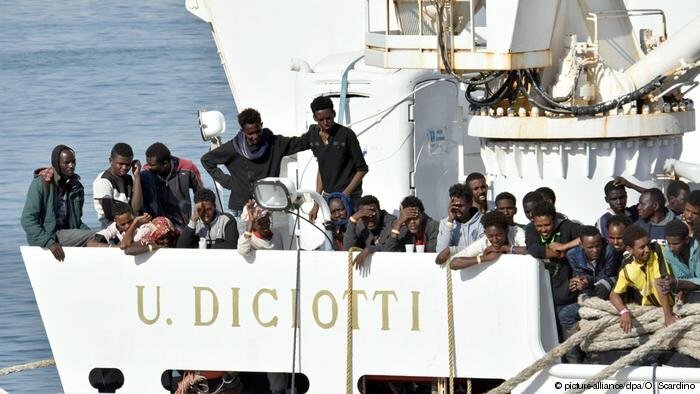 On Wednesday, March 20 the Italian Senate is expected to vote on the so-called “Caso Diciotti” the case of the Italian navy ship Diciotti which rescued 177 migrants in summer 2018 and was blocked for several days before finally disembarking people in Catania and dividing them between several European countries. A tribunal in Catania has asked that Salvini be put on trial for 'kidnapping' the people aboard the Diciotti because he blocked them from disembarking, holding them ‘captive’ effectively in the port. Parliament’s lower house already rejected the request on February 19 and now it is the turn of the Senate. Salvini told reporters that he would go in to the Senate with his “head held high.” “If they arrest me because I wanted to defend my country’s borders and its security I would be proud. It is no problem, they do not scare me,” he concluded. The numbers in the Senate are on Salvini’s side, reports AGI. Whilst the Mare Jonio was waiting to know if it could enter an Italian port, Mediterranea Saving Humans tweeted that the IOM was reporting news of a further shipwreck off the Libyan coast, in which "tens of people are thought to have died." The boat docked on Tuesday evening and was immediately seized by the Italian authorities. Salvini, on his twitter feed, using the hashtag #marejonio, praised the work of the Coastguard and the Guardia di Finanza and said "In Italy today, there is a government which makes sure borders are respected and laws are obeyed. Anyone who infringes these laws must pay!"